This is the world of the horse, a herd animal who’s hardwired nature states that they must establish their place in the herd and then maintain it. Always aware that there may be an opportunity to advance their ranking, horses are constantly testing and looking for weaknesses; pushing on the next guy up the ladder. This is also how they act towards humans- they don’t know any other way to be. Even a sweet natured guy like Casimere will still test his human handler in subtle ways over an extended period but a horse like Santos will waste no time establishing himself. I’ve never been the sort of rider to go for this type of hyper-dominant personality in a horse but I need to ride this guy and get along with him. With Derek’s help, I’m able to convince Santos to follow with me in the groundwork exercises, “Now you sit on the horse,” Derek holds the off side stirrup iron as I mount up. I’ve been riding Casimere since last Fall, I’ve grown accustomed to the way he moves and feels- he’s a comfortable place to be. Santos is quite different; he feels different. In the saddle, the challenges continue, I ask for the trot, Santos reacts by tossing his head and showing me his teeth. This would be the point where the novice rider backs down, “Ok then, he doesn’t like that so I won’t do it again.” But this is actually the moment of truth who is riding who? “You must be firm,” Derek is keeping close tabs, “This is how people get into to trouble, they train this behavior into the horse.” I push through; asking for the trot once more. Santos once again tosses his head and shows me his teeth as he attempts to bite my leg, this time I show him my whip. By responding to Santos’ challenges instead of relenting to them, things settle down after only a few minutes and we start having a nice lesson. The muscled red gelding is light and responsive when I ask for leg-yields and his sitting trot is smoother than Casimere’s. “Now we canter the horse,” Derek is in the center of the arena. We’re inside today, as it’s raining outdoors. I ask for the canter and Santos responds nicely. I was feeling pretty good about myself at this point, “hey, I can ride this big bossy boy!” We’re cantering ten meter circles in the center of the indoor arena when quite suddenly- zing! He’s off! I mean flat-out bolting across the box- yikes! I manage to catch him at about the fourth stride. I admit that my first wild ride on Santos put me off the big guy for a while. 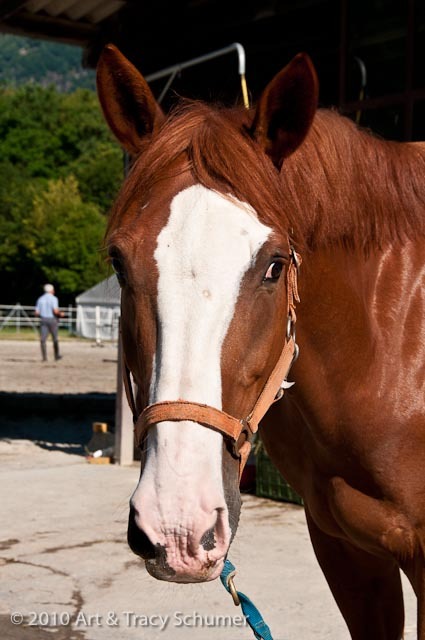 I later learned that the sorrel gelding with the cute white face has a legendary reputation at Scuderia alle Gerre. Whenever Santos is out in the alleyway of the barn, everyone is advised to take care, “attention Santos!”. I brought a friend to visit the barn one day and as we walked down the line of stalls admiring all of the perfectly groomed horses in their immaculately clean boxes, we came upon Santos. We had already been advised to watch ourselves of course but we weren’t quite quick enough. 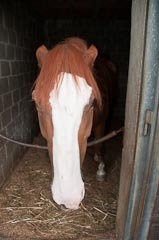 Like a bolt of red fury lightening, Santos struck out from his stall at my friend with pinned ears and flashing teeth. She was able to leap back enough that Santos only managed to shred her jacket instead of slashing her arm. Another trainer would probably have sent this horse down the road ages ago but here he’s understood and gets the respect he deserves. Santos isn’t crazy, he can certainly be aggressive in his box but he’s not actually dangerous, he’s just very smart and highly dominant. Santos is keenly aware of who is sitting on him. In Derek’s hands, he can look like an Olympic level champion. Once, shortly after first arriving at the barn, Derek was giving a lesson with Santos and an adult student. During the lesson, Santos bucked off his rider then proceeded to try to stomp his hapless victim before Derek stepped in and took control. This sounds disturbing but when I saw Santos recently, he was packing a twelve year old girl during the barn’s summer camp program. On this day, Santos was moving as if he knew he had special cargo, his ears flopped out to either side of his head, he looked like the sweetest, kindest, kid-horse you’ve ever seen. It’s this sort of perceived conflict in personality that confuses a lot of people including me. 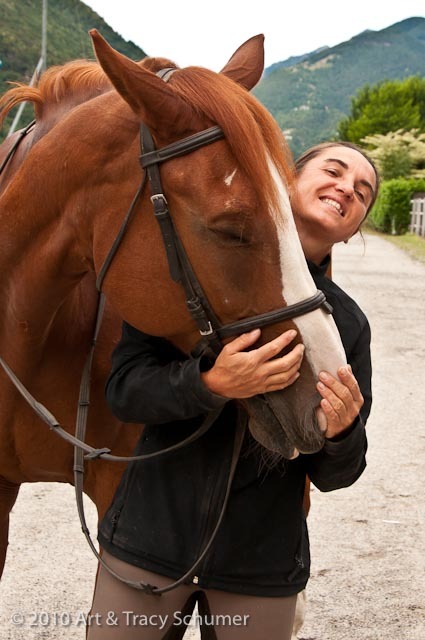 We don’t tend to associate a complex thinking personality with a horse but this is exactly what a guy like Santos has. Its taken me a while to get my head wrapped around this sorrel gelding; I’ve never seen another horse quite like him. I did finally ride him again and it went a little better the second time. I had mentally prepared myself and was all ready to take on “the stallion” but on this day Santos was actually quite calm and pleasant. We had a nice lesson and he didn’t even try to bite me. Then towards the end, I relaxed and happily announced to Derek that I was now confident riding Santos. No sooner had the words left my mouth when Santos suddenly lunged sideways then spun around on his haunches. I was lucky and stayed with him, I could see Derek smiling from across the arena, “The lesson is not over until you are off the horse and back on the ground”. Comments for "Santos "The Stallion""
Miss Denise on October 25, 2010 Ah, the old boy’s just looking for a leader. You go girl.